The finding, published this week in the Journal of the American College of Cardiology, could improve understanding of the disease and lead to new treatments. 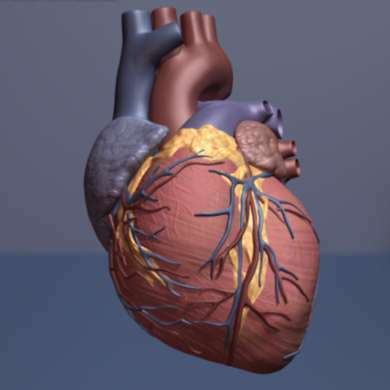 "There are many kinds of cardiomyopathies that can lead to heart failure so this is a serious problem," said Teisha J. Rowland, PhD, a post-doctoral fellow in the lab of Luisa Mestroni, MD, and Matthew R. G. Taylor, MD, PhD, at the University of Colorado School of Medicine and first author of the study. The Mestroni and Taylor lab sequenced nearly 5,000 genes in 335 patients with a family history of heart muscle disease, looking for mutations that could cause a variety of cardiomyopathies. "Many kinds of heart disease are caused by genetics. When that happens, the disease is often more severe and happens at an earlier age," said Rowland, who studies genetics and cardiology. "So we look at the DNA in entire families to see what sort of genetic variants those with the illness have in common." They found that several people with left ventricular noncompaction (LVNC) had a mutation in a gene called Obscurin. Obscurin is part of the sarcomere, the basic unit of striated muscles that pull and glide past each other when muscles contract. That includes the heart muscle. If there is a mutation in Obscurin that process may not function properly. "We found a strong association between this gene, which has not been studied much, and this rare form of genetic heart disease," Rowland said. "Left ventricular noncompaction is thought to happen during early human development. It would be interesting to see if mutated Obscurin affects heart formation during development." Rowland said the findings point to areas warranting further attention. "We expect this will ultimately improve our understanding of the disease," she said.